The impact of this film was enormous. With it, John Frankenheimer became a force to reckon with in contemporary cinema; it established him as the most artistic, realistic and vital film-maker at work in America or elsewhere. It came out at a time when it was clearly dangerous to speak of politics in the out-spoken, satiric anti-McCarthy vein that characterised this picture. Although Condon's book, which Axelrod follows faithfully in his screenplay, had been published, it is not outspoken books that upset politicians, churches, pressure groups and the like, but outspoken movies. The depiction on the screen of certain aspects of life described by novelists without too much fear of censorship, results in cries of rage and anguish. THE MANCHURIAN CANDIDATE provoked its expected share, but fortunately, the film was too great an achievement, both in commercial and artistic terms, to go down before it. Swept along by good reviews, the popularity of Frank Sinatra, and the still strong tide of liberalism in the United States, it dealt a crushing blow to the extreme Right and spoke up for sanity, commonsense, and freedom from fear in its most overt, psychological sense. - Gerald Pratley, The Cinema of John Frankenheimer, Zwemmer/Barnes 1969. 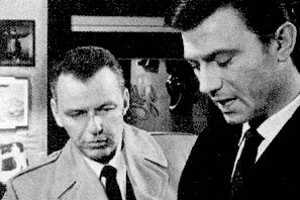 "Now we come to the first film I really instigated and had complete control over, THE MANCHURIAN CANDIDATE. This is the film I did exactly as I wanted it to be; we had a lot of difficulties, George Axelrod and I, as it was not a subject that most studios wanted to make. But it meant a great deal to me, and this is the basis on which I decide what stories and subjects I want to film. You have to feel terribly involved, and it has to be something that means a great deal to you, that you feel very deeply about; and it has to be a statement that you want to make as a human being and as an artist. Anybody who becomes involved in a film for other reasons is doing it all wrong. And you must really and desperately want to make it. Fortunately, all our difficulties disappeared because George was friendly with Frank Sinatra. He'd known him through the years and I think he'd seen him socially and told him he owned The Manchurian Candidate and Sinatra said, 'God, I always wanted to do that.' As soon as Sinatra said he wanted to do it, we could have shot it at any studio in town. After that there were no problems. "Frank was delightful to work with. All the stories I've heard about him I cannot believe. He's one of the most charming human beings I've ever met. He really worked terribly hard on this film. Without trying to economise or compromise in any way, we shot the entire film in thirty-nine days. We had actors who came in and knew their lines, and I must say I had a very clear concept of the entire movie due partially to George Axelrod whom I admire a great deal. We got along very well, and we talked out the whole film. I was also fortunate to have, as an Art Director, Richard Sylbert who has done most of Kazan's films as well as The Graduate, and Rosemary's Baby, and he did Grand Prix for me. He's an imaginative Art Director and he built most of the sets for THE MANCHURIAN CANDIDATE in the studio. Everybody thinks it was done on location. We did the Madison Square Garden scenes in just four days in Madison Square Gardens and the rest of them in a local California stadium called the Olympic Auditorium and on the stage. But Sylbert is so clever you are never really aware of it. "If you look at some of the plays like The Comedian, which I did on television, you'll see the same kind of style that I used in THE MANCHURIAN CANDIDATE. It was the first time I'd had the courage, the assurance and self-confidence to go back to what I really had been good at in television. But it had taken many years to do it; perhaps not that many when you start to think about it because THE MANCHURIAN CANDIDATE was made in 1962, so in fact it had taken two years. I had complete control, it was up to me to face up to it. I did not have this contractually on All Fall Down, but I assumed it because of my friendship with Houseman. I edited it right through to the finished print. I was able to do this on Birdman too, but only after many fights and arguments. "I thought that Condon's The Manchurian Candidate was one of the best books I had ever read. I just couldn't put it down and after I had read it, I thought, 'I've just got to make a film of it.' It had great social and political significance for me at the time, and it has certainly been - unfortunately - a horribly prophetic film. It's frightening what has happened in our country since that film was made. It's amazing how often the picture is referred to in terms of techniques that are going on in North Vietnam at this point, and in Korea and elsewhere - they come right out of THE MANCHURIAN CANDIDATE. In other words, George Axelrod, who has a marvellously fertile mind, used to say to me, 'This could really very easily happen: In our own kind of half-kidding, half-serious way we convinced ourselves that this could be true. And the more events have taken place the way they have been happening, the more I think it probably is true. A lot of the things we just hinted at in the film. Then we started to get absorbed in the story and realised that what we had was something that could very well be a lot closer to the truth than many people imagined. We consulted every book written about brainwashing, and I remember reading one called In Every War But One, about American prisoners of war in Korea, and not one prisoner ever attempted to escape. It was the story about how the Chinese brainwashed these men, what they did to them, and things like that; and while it wasn't quite as total as the brainwashing in THE MANCHURIAN CANDIDATE it was nevertheless a very distinct type of brainwashing that they'd known. On another level we believed that we lived in a society that was brainwashed. And I wanted to do something about it. "I think that our society is brainwashed by television commercials, by advertising, by politicians, by a censored press (which does exist in this country whether you want to admit it or not) with its biased reporting. More and more I think that our society is becoming manipulated and controlled. Here was an individual trying to fight the inner conflicts which tormented him - a subject I've always been drawn to. You should read the book because, like Rosemary's Baby, it is a faithful translation. I think everyone would agree that George Axelrod's screenplay of THE MANCHURIAN CANDIDATE is probably one of the best adaptations from a novel to the screen with which I have been associated. I think people tend to forget George's contribution to the film. They always talk about it as a great film of mine, but George was very responsible too, and I think that that should be pointed out. Also, the most important aspect is that this country was just recovering from the McCarthy era and nothing had ever been filmed about it. I wanted to do a picture that showed how ludicrous the whole McCarthy far Right syndrome was and how dangerous the far Left syndrome is. I'm thinking now about this. I forget at times how I felt then. It's so difficult to go back over one's life. It had a great significance for me. It really dealt with the McCarthy era, the whole idea of fanaticism, the far Right and far Left really being exactly the same thing, and the idiocy of it. I wanted to show that and I think we did." - John Frankenheimer - talking to Gerald Pratley, The Cinema of John Frankenheimer, Zwemmer/Barnes 1969.